Description Make matches of 4 bubbles in this unique matching game. Change the center of gravity to move all balls around it, do this strategically and make as much same colored collections. 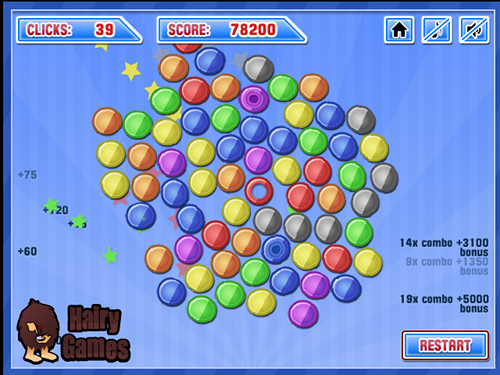 Controls Click on any ball to transform it into the center of gravity, all other balls will move in it's direction. I've seen this game at reddit a month ago and already reviewed - Excellent idea! Every time I think everything in casual gameplay already invented and done appears new game like this :) Thanks for the upload!